In this programme for viola and new media, the four composers Anne Wellmer, Stevie Wishart, Chiyoko Szlavnics and Andrea Neumann created for this program for viola a few new works and rewrited some existing compositions. Besides being composers, they are also performers, and specifically improvisers. This obviously has a strong influence on their methodology. Similarly, the altviolinist Julia Eckhardt is familiar with comtemporary music that is both composed and improvised, and has worked closely with all four composers and created their pieces of music. A new work for viola and tape is written by Stevie Wishart, who is doing research on the possibilities of improvisation within composition: registered sounds are confronted and mixed with elements of akoustic composed material. Andrea Neumann, who is particularly interested in the musicians’ performativity and gestures, composed a new work for viola and electronics in interaction with the performer. Her piece “around” is (beside others) a piece featuring the -normally not focused- mouvements a performance is surrounded and supported by. Furthermore, the programme also features two pieces that were recorded in earlier collaboration projects: ‘green piece’ (2005), written by Anne Wellmer and ‘Structures in the Mind’s Eye (Passage)’, for viola and sinus tones, written by Chiyoko Szlavnics. Anne Wellmer’s ‘green piece’ (for viola, feedback, tape and light) is a composition of overtone structures shaped by the acoustic behaviour of the viola, loudspeakers and the performance space; together they become one instrument and form a sonic environment. The player creates pitches and overtone melodies by playing both the viola and the feedback which occurs between a microphone on the viola player’s head and loudspeakers in the space. (based on the project ‘do-undo’ by Q-O2). Chiyoko Szlavnics rewrote ‘Structures in the Mind’s Eye (Passage)’, a piece that explores structures in space and time––on a white page, as visual art, and through sound. The piece was generated by three drawings, meant to be viewed as a tryptich. Travel and passage are central themes in this work. The playback of train recordings brings out existential ideas of how movement and time are related, and how sounds produced by musical instruments are essentially based on the same principles of mechanics and physics that surround us in daily life. 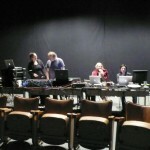 With support of the Flemish authorities, especially for the compositions written by Stevie Wishart and Andrea Neumann.